New Orleans Part of the problem in understanding the real, core issues with the Affordable Care Act and the way in which employers, especially those specializing in lower waged workforces, are jacking with the system is separating the ideological polemics from the facts in order to see whose ox is really being gored. For example, take a story in the Wall Street Journal about some Sodexo workers losing their company insurance because the company has classified them as “variable” workers. You might wonder what a “variable” worker is. Good question! Essentially, these workers are “tweeners,” not regular full-time, though sometimes they are working 40 hours or more a week, and not regular part-time, where they are working 20 or more, but folks whose schedules are, yes, you have it, variable. Seasonal workers at race tracks, amusement parks, and college campuses are all good examples, as are many hotel workers. Why is this important? Because remember the bright line test for mandatory coverage under the Affordable Care Act is a worker averaging 30 hours per week, and that’s where we find the rub. Under the Act the IRS allows a “look back” period of up to a previous year in determining whether or not a worker made the 30 hour average by January 1, 2015 to determine whether the company has to cover the worker. With me now? 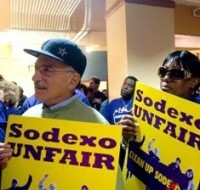 Without a doubt Sodexo is a sucky company, and that’s nothing new. With 125000 workers in the US, the French-based global services company specializes in food service, janitorial, and similar contracts by cutting wages and displacing fulltime workers. They warrant no sympathy from anyone and have been targets over the years of extensive union organizing campaigns launched by UNITE HERE and SEIU. ACORN International partnered with these unions in researching worker conditions in Peru and India with our members there and found deplorable living and working conditions and numerous cases of wage theft so, let’s be clear, there’s no love lost. Nonetheless Sodexo defends its reclassification of variable workers, who will now lose access to its company policy by saying they will now “be able to get access to benefits on the public exchanges in ways they couldn’t have before,” which is actually true. The worker whose story drives the Journal handwringing says she was paying $69 per week for her and her husband on the company plan or $296.70 per month. On the exchange she is now paying $231 per month. That’s actually $65.70 less per month. The article doesn’t say anything about her husband, but we are led to assume the comparison is apples to apples, because the criticism included by the reporter is that she now has a high deductible plan. The Journal is silent on what kind of plan Sodexo was offering, but trust me, it would be a miracle if Sodexo was not also offering a low premium – high deductible plan, since that’s the way the vast majority of large, lower wage employers have moved en masse in the wake of Obamacare. Furthermore, most of them were already there, so they didn’t have to move far, they just had to get their usually crappy plans that very few chose under 9.5% of gross income for the workers, which pushed premiums down and deductibles up. Sodexo is claiming all of their shenanigans “on a net basis, are costing the company material amounts of money,” which in English means they are still whining. Who knows? And, who knows as well whether these workers might actually be better off with Obamacare in terms of cost and coverage than staying on the Sodexo. Certainly this story provides the politics without the proofs. The only things we know for sure is that these workers need more hours and higher wages from Sodexo, because that’s the way the Sodexo business model works and the way these contracting outfits roll. The rest of the story on “variable” workers is a head scratcher with “”Eeny, meeny, miny, moe” being about as good as any way to tell if the workers’ health coverage is better with Sodexo or Obamacare, although I’d guess the better bet is actually Obamacare, rather than Sodexo. This entry was posted in ACORN, ACORN International, Citizen Wealth, Financial Justice, Health Care, International, Labor Organizing, Organizing and tagged Affordable Care Act, obamacare, Sodexho, variable workers, workers by Wade. Bookmark the permalink.